What are the Benefits of QuickBooks NonProfit Accounting Software? Nonprofit businesses hold a very important place in our society. These businesses are run by Board of Directors, Officers, Employees, and Volunteers all for the betterment of humans or animals. This article will explain the benefits of using QuickBooks Nonprofit accounting software to help track and report nonprofit financial data. You will get a brief overview of what a nonprofit is, learn how class tracking can help, and review the nonprofit specific reports. Do you need help in setting up your Nonprofit business in QuickBooks? Are you looking to purchase QuickBooks? Give us a call at 800-216-0763 to speak with one of our Pro Advisors about our QuickBooks support plan. We can help with installation and setup, training on how to move efficiently to save you time and setting up the reports to meet your needs. Call today! What Qualifies a Business as a NonProfit? They are not in business to make a profit and may qualify for a 501(c)(3) tax-exempt status with the IRS. Nonprofit businesses acquire their funds through donations or fundraising or awarded through grants or other fund sources. These accumulated monies must stay within the nonprofit to be used in the running and improvement of the business. These funds may be spent on funding special programs that a business provides, employees payroll and office expenses among other things. Unique Features of QuickBooks Desktop-NonProfit. There are a number of great features when choosing QuickBooks Premier or Enterprise-Nonprofit. The most important one is that the setup is geared to a nonprofit’s specific needs. A nonprofit will save time and efficiency when up to 30 users can simultaneously work within QuickBooks. Create a more secure data file designating user permissions for each user and give them the ability to only access the data they need. Nonprofit terminology will make the learning curve easier for those users familiar with the nonprofit industry. QuickBooks Desktop-Nonprofit can be further customized where needed to make it uniquely fit each business. Class tracking can be used to further break down the income and expenses within categories like various nonprofit programs. This makes reporting by program easier. Install the Nonprofit version and a number of great nonprofit reports are already set up to use. Financial reports that can be delivered to the top board members or used to complete IRS or other state agency returns. There are many instances of nonprofit terminology that are included in this version such as Donors, Donations, Pledges, Programs and Projects, Grants, IRS 990 form reporting. For example, customers are donors, jobs are grants, invoices are used to track pledges and sales receipts are used for donations. Form templates, statements and reports all use the same nonprofit language for better understanding. Save time from searching the menu lists for the most frequently used activities a nonprofit needs. Some of the customer, vendor, and banking activities under their own separate menu lists are all found together under one nonprofit menu list. You can create an invoice, receive a payment and make a deposit by using the NonProfit menu list see below. Class Tracking should be turned on as part of the initial setup of your company file. A class breaks down the income, expenses, assets, liabilities or equity of a business by department, location, funding source, program, grant, fundraising, or administrative type. The class is used to categorize a smaller section of the business so that additional reporting can be run on these subsections. Class hierarchy can be divided down by class:subclass and to sub:subclass, if necessary. More detailed reports can be run to view either all classes or certain subsections. This is a big benefit to nonprofits that have to report to their board or outside agencies. For example, you can run a Profit and Loss Report by Class and get a breakdown of the income and expenses by grant or funding source. Class tracking has to be turned on and your class list is set up to include each fund source and grant. Be aware you must add the right class to each and every transaction as you go. A Sales Order is used to record the promise of incoming funds that will be fulfilled sometime in the future. These incoming funds could be for a donors sponsorship of an event to be held at some future date. It could be used for collecting reservations for a dinner planned on a particular holiday, months ahead. Or the nonprofit could track tuition for a class planned, but not yet held. The Sales Order is a non-posting transaction, meaning it won’t show up in the general ledger. The benefit is to be able to track these types of future payments before the donors, sponsors or individuals are invoiced. The invoice is the transaction tracked in QuickBooks between the nonprofit and the paying individual or group. The invoice will include the customer and their billing address, date, terms of payment, item (what is being purchased), description, amount, total and sales tax if applicable. A nonprofit could benefit by using these sales orders any time they want to keep track of future income of a product or service. When the sale is ready to be completed you can turn the Sales Order into an Invoice for payment using a one-click process at the top of the sales order screen. Sales Orders are available in QuickBooks Nonprofit and should be remembered if the need to track future funds is necessary. QuickBooks Nonprofit reports include all the great reports that you get in the regular QuickBooks Pro and then include a number of reports designed specifically for Nonprofits. These reports are not available in QuickBooks Pro, Simple Start, and QuickBooks Online Essential. Nonprofit businesses often have to report to a Board of Directors or other key personnel within the business. With the specific Nonprofit Reports, the big benefit here would be in the ability to map your accounts to what is on the annual IRS 990 tax return. Make sure you have your accountant or tax preparer oversee this activity so that the mapping is done correctly. QuickBooks has 990 Statement of Functional Expenses report that can be printed to be used while filling out the 990 Return of Organization Exempt from Income Tax return. 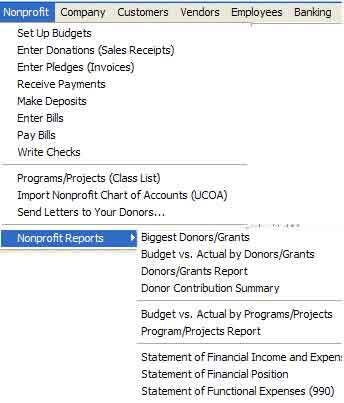 There are also a number of nonprofit reports that are easily accessible such as Donor reports, Budget reports, and Statement reports. Can create reports that cover all Donors, Funding Sources and Grants or a subsection that can be filtered on by class. Donors/Grants Report: This report shows how much money each donor donated and how much of that money was actually spent. This report could be filtered down to show only one donor and that Donor’s income and expense accounts. Donor Contribution Summary: This is a summary report to show the total donated funds by each donor or by grant. You can filter this report by time period: month or year, by individual donor, or by customer type if needed. Biggest Donors/Grants: This report shows the total amount of funds contributed by each donor with the biggest at the top of the list. The biggest donors/grants report would be helpful during fundraising efforts and can be turned into the IRS with the 990 annual return. Budget vs Actual by Donors/Grants: This is a comparison report on the amount of money each donor has donated and how much of those funds have been spent versus what was budgeted over a period of time. Budget vs Actual by Programs/Projects: This is another comparison report on the amount of money donated to each program or project versus what was budgeted for a period of time. Statement of Financial Income and Expense: Similar to a Profit and Loss report, however, this report is reporting by each class. Statement of Financial Position: Similar to the Balance sheet report, however, this report shows the balance sheet from both this year and last and the dollar and %changes. This report can be can be provided to any outside source who wants to see how the Nonprofit is doing financially at a specific point in time. Usually, the board of directors, banks, and other funding sources or outside inquiries may be interested in seeing this report. Which QuickBooks Nonprofit Version is Best For You? Over its three years supported life, QuickBooks Premier is less expensive than the other two versions. Call 800-216-0763 to speak with one of our knowledgeable customer service representatives for best pricing and help with the order process. Enterprise has much larger database limits which can hold up to 100,000 customer, vendor, employee, or item names. Call 800-216-0763 to speak with one of our knowledgeable customer service representatives for more details on the different subscription levels and best pricing. Call 800-216-0763 to speak with one of our knowledgeable customer service representatives for more details on the subscription levels and best pricing.